This package contains an art template for letter b that can be used when teaching the letter b. In this package you will receive one art template for "b is for bird". IF YOU ARE LOOKING FOR A HUGE COLLECTION OF LETTER ART- ALPHABET ACTIVITIES PLEASE CHECK OUT THIS BUNDLE WHICH IS A GROWING MEGA BUNDLE AND PRESENTLY CONTAINS MORE THAN 85 LETTER ART TEMPLATES. The designs are hand drawn by myself and all work in this package is my original work. When I teach a new letter each week, I do at least one cut and paste activity that relates directly to my letter of the week. Each week, I design a new art for the new letter we are learning. The activities in this package are designed to be used when teaching the letter B. 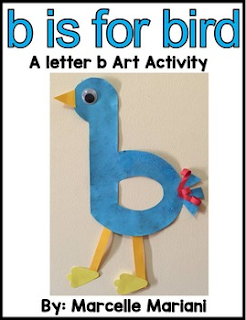 1 Art template for "b is for bird" - the letter b used in this art is the lowercase letter b.
I use these as a CUT and PASTE activity in my literacy art centers BUT you can use these template as models with construction paper or using 3D objects (shredded paper, paper strips, sparkles).